Series 3 of LOL Surprise is now out with the new exciting Confetti Pop Tots Dolls. The new features are more surprising and outrageous than ever before with 9 new layers and a new and fun way to unbox your doll and accessories. Lol Surprise Tot Doll with Water Surprise. It also comes with a collector poster so you can see which dolls there are to collect. The Confetti Pop LOL surprise dolls are £10.99 and can be bought from Smyths Toy Store. 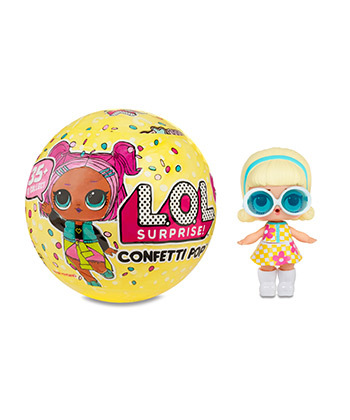 How would you like to win one of these New Lol Surprise Confetti Pop Dolls? Simply enter on the gleam app below for your chance to win! Nice read and give away. Would love to win for my daughter. Cousin's grand- daughters. We may have a fan in the making, as new addition to the family expected later in the year. my niece is really into these. My niece is obsessed with LOL dolls! For my daughter, she loves these. Our youngest loves them but I find most children love little toys for little hands. In my family it has to be my niece for sure! My daughter - she is really keen to collect as many as she can. My daughter Heidi LOVES LOL surprises! We have the big Ball Full of LoL Dolls and so far we have collected two of their Pets. My daughter's love these, just make sure you have your vacuum cleaner close to hand! My oldest niece loves them. My niece Sofia loves them. I wish I'd invented them! Titch loves these but Mum & Dad aren't so keen as they feel like Lego bricks on your naked instep! My little boy is obsessed with LOL Surprise dolls. He can name them all and he is 3. My two younger daughters love them! My girl loves LOL Surprise so much! my daughter loves these. She has a few but wants to collect them all! My little girl loves LOL she always tells me off for pronouncing it lol instead of L-O-L.
My 5 year old daughter Jessica! My little girl adores them! LOL dolls are the best. i reckon my daughter would love these - she doesn't have any yet but its the sort of thing she would adore! My daughter would love to own a LOL surprise? My little girl loves them,she has autism and is a little obsessed!! My goddaughters love these - anything small and cute. My ten year old daughter - she's actually obsessed with these dolls. My daughter had her first LOL surprise recently and loves it. She would love another one. My 5 year old daughter. My niece does, and I reckon I probably would have when I was her age! My friends little girl Chloe. My granddaughter Bonnie would have fun with these! My neice Matylda! She comes and rings them yo my house when she comes to visit and gets excited at the new ones she wants to show me! My great-niece Phoenix loves them and I really like the surprise too. My daughter adores them! Thanks for the competition. My daughter, everytime she sees one, I do not hear the end of it until she gets one!